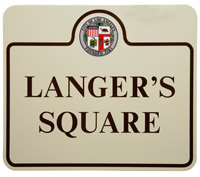 It is our honor to have the intersection of 7th and Alvarado dedicated “Langer’s Square” by the City of Los Angeles. Thanks to the efforts of Los Angeles City Council Member Ed Reyes (3rd District, now retired) and members of the Rampart Division of the Los Angeles Police Department, we received this honor on January 24, 2008, celebrating what would have been founder Al Langer’s 95th birthday. Accompanying is video capturing the highlights of this wonderful day. Our most sincere thanks to all who have helped us survive and thrive since 1947, including our friends at Council District 3, Rampart Division of the Los Angeles Police Department, Department of Streets, and the Office of the Mayor of the City of Los Angeles.